If your Magento 2 store supports rating and review for the items, then adding the feature that allows sorting all the items by rating will be appreciated by the shoppers. In order to bring the best experience to the customer while using Layered Navigation extension for Magento 2, Mageplaza now provides an advantageous feature, called Filter by Rating. Filter by Rating takes responsibility of sorting the products by the rating. 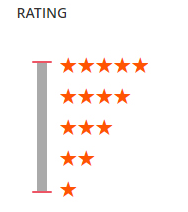 When you enable this feature in the configuration, a Rating section will appear in your store’s Layered Navigation with 5 options from 1 to 5 stars rating. For example: If the shopper chooses the 4-star option, in a second, the items which have the 4-star rating and up will be displayed. Rating filter will be performed in Vertical Slider form. To suggest more choices to shoppers and boost the sales, the store owners usually promote the New or Sale products collection. By enabling Filter by Rating feature, you will have another great way to introduce the popular products by letting your customers choose what is important to them. Besides, those items have higher rating always grab the shopper’s attention more. A higher rating, the more trust. The shoppers more likely to make a purchase with an item which has the better review. Otherwise, if the shopper is considering to buy a product, the good rating will be an advantage that positively affects his decision. No wonder your business will grow significantly. The conversion rate is critical for any eCommerce site. Basically, the conversion rate is the percentage of users who take the desired action. Having a good conversion rate is the foundation of high sales volume and a healthy business turnover. By using the Filter by Rating on the Layered Navigation, the shoppers can save much time and effort in finding their be-wished items. Improving the user experience never easier than that. As a result, your store’s conversion rate will be completely improved and boost your business performance. It’s effortless to config the Filter by Rating feature settings. This field is available under Mageplaza > Layered Navigation > Configuration > Filter Configuration > Rating Filter. In this section, you can choose to enable this feature by setting as Yes and leave as No to disable. Besides, you can edit the Group Label and set as Yes/ No the Expand by default field to Active/ Deactive this convenient extra feature. Finally, choose Save Config to save and check the result.